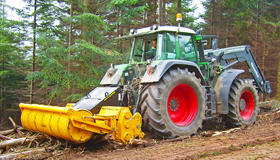 GUTZWILLER is a specialist in forestry shredding, offering a large range of forestry cutters capable of operating at down to 40 cm depth. 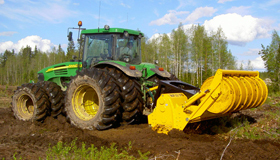 Forestry stumpers or dozers with an operating width of 1.40 to 3.55 m are designed for shredding pruning wood, branches, cutting waste, stumps as well as for deforestation, shredding and cutting work down to a good depth in a wide range of terrains. 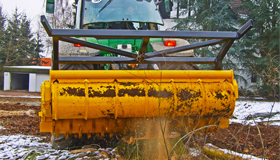 On these shredders, the rotor turns in the opposite direction of movement in forward gear and and in the in the opposite direction of movement in reverse gear. In reverse gear the materials are lifted into the trailer body and shredded by a system of counter-cutting knives. 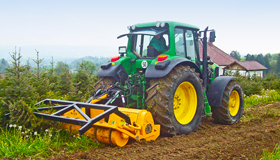 In forward gear the materials are injected into the ground then levelled by the roller. Thanks to a low rotation speed, and perfect distribution of the carbide tips, the machines can work as well outside the soil as in the soil. Low required power relative to the shredding capacity. Shredding capacity up to 40 cm depending on the model. The shredded wood is defibrated and mixed in the ground. The modular construction allows selection of adequate equipment. Light and robust design, in high quality steel.